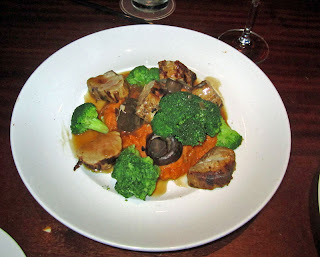 I've wanted to visit Seasons 52 Fresh Grill for a long time, but some gift cards received over Christmas were all the incentive we needed, and we had a very nice meal there on a recent Sunday Evening. I'm not sure why we waited so long! Season's 52 is a chain, but it offers very fine dining with a menu that changes with the seasons. We were there for the winter menu, and it was very good. We had made a reservation and so were seated promptly. Through the course of the evenign, our service was spot-on impeccable, very impressive. We were seated in a room not part of the main dining area, it was very nice. As the evening progressed a few other tables were also seated in the room, but it never got at all loud, I loved the semi-private feel and the ability to hold a normal level of conversation. 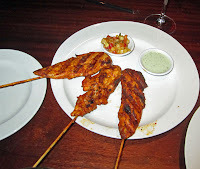 Grilled Spicy Tandoori Chicken Skewers, three skewers of chicken were cooked perfectly and had a very nice spicy heat to them. 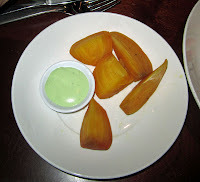 They were served with a tiny portion of mango chutney and a cucumber herb raita. I loved this dish, but Tommy found it a bit too hot (spicy hot) for his taste. Well, more for me! I really thought it was tasty and flavorful, a nice heat that did not overpower, and chicken that was very tender. 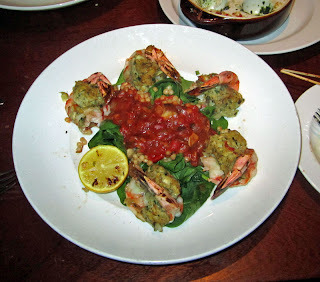 Our second appetizer was the Roasted Shrimp, Lump Crab & Spinach Stuffed Mushrooms. They were also very good and came out piping hot! 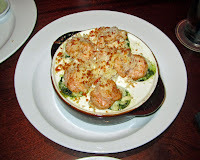 There were a lot of flavors going on here, and they were served in an escargot type of serving dish, topped with panko and parmesan and broiled. They were good, but hot as in temperature hot. There was a lot of flavor so it was a bit hard to pick out the shrimp vs. the crab vs. the lobster. Yet it was a veritable seafood fest in my mouth, the flavors of the sea were dancing on my tongue, and then tamed by the woodsy mushroom. Yumm! For my main course, I had the Stuffed Tiger Shrimp. Five large tiger shrimp were butterflied and topped with a nice stuffing, then cooked. I think the shrimp were, however, just a bit overdone. I'm pretty picky about shrimp, and these could have used just about 30 seconds less cooking time, but that is the problem with stuffed shrimp. They were served around a bed of spinach that was topped with a wonderful sort of tomato ragu--it was very fresh and flavorful, and was probalby my most favorite part of this dish. I did think the $21 tab a bit high, however, for what I got, but then again, I was paying for a magnificent atmosphere. Still, overall I enjoyed this dish. Tommy ordered the Wood-Roasted Pork Tenderloin. The menu said it came on a bed of polenta, but when he asked about sweet potatoes instead, that was absolutely no problem! The dish was served with perfectly cooked broccoli and cremini mushrooms and a dijon glaze. The meat was fantastic, tender, juicy, and full of nice pork flavor. It is not easy to cook pork tenderloin so it is very buttery, but they did it. Tommy loved his dish and I thoroughly enjoyed the tastes I had, from the port tenderloin to the veggies and even to the sweet potatoes which were very smooth and buttery, and not overly sweet. This was a great dish and I'd order it again! I spied one item on the menu which I just had to try as a side dish: Golden Beets. I am glad I did. They beets had been gently roasted and still had a nice texture to them. They were served with a wasabi sauce on the side. The wasabit was a perfect complement to the buttery, very "rooty" taste of the beets. They were absolutley, out of this world delicious. I will have to try to make this type of dish myself some time, I absolutely loved it. 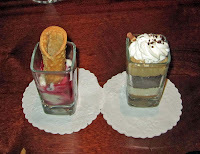 We'd had our fill and were about ready for the check when along came our server with a tray full of their Mini Indulgences--basically shot glasses filled with various desserts of custard, cream, ice cream, and the like. Every one looked fantastice, and, given their small size, we succumbed to the temptation, have a Mocha Machiato and a Canoli. Both were excellent, and small enough that we didn't get overly full. As a matter of fact, one of the "boasts" of Season's 52 is that all of their entrees are less than 475 calories. I have to say, the portions were a right size for a meal, not overly huge. But each bite of all that we had was full of flavor. Season's 52 is not a cheap place, our total bill before tip and tax was about $82. But it was a very nice experience, and good place for that special event or special evening with a special someone. I'm sure I'll be back to try the menu in anoter season! We dined recently at the "new" Marco Dino's Ristorante on Magnolia Square in downtown Sanford, and were pleased! Formerly the location of Stone's Throw Bistro, Marco Dino's is owned by the same chef, the talented Rich Lendino, but now features Italian fare--Rich has gone back to his roots. We enjoyed the meal, the service, and the ambience on our recent visit there. Upon entering, we were promptly greeted by the maitre d', who, through the course of our visit, seemed to ensure that the front of the house ran smoothly. For our drinks, my friend Tommy ordered a specialty drink, the Dreamsicle. It tasted just like a dreamsicle, sweet, a bit of citrus tang, and very delicious. 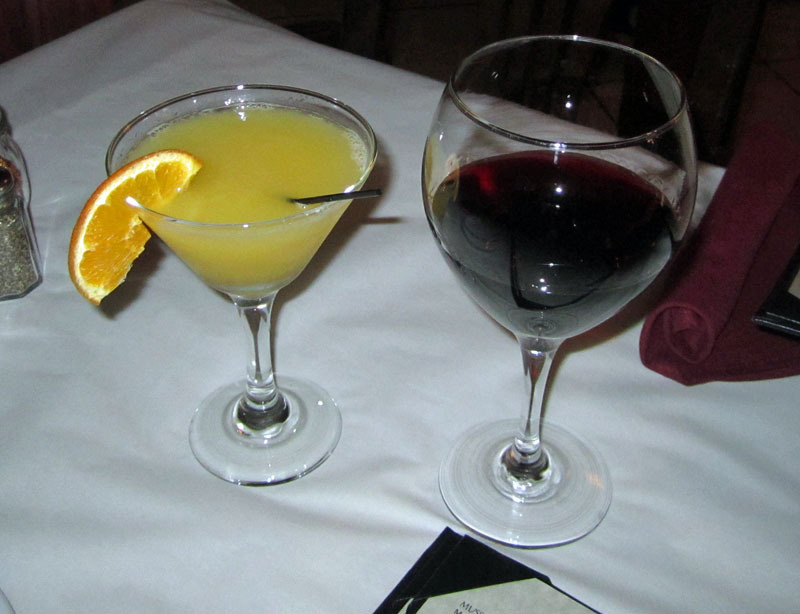 I had a glass of the house Merlot--also a very fine choice. I'd have to say dinner was off to a fine start. 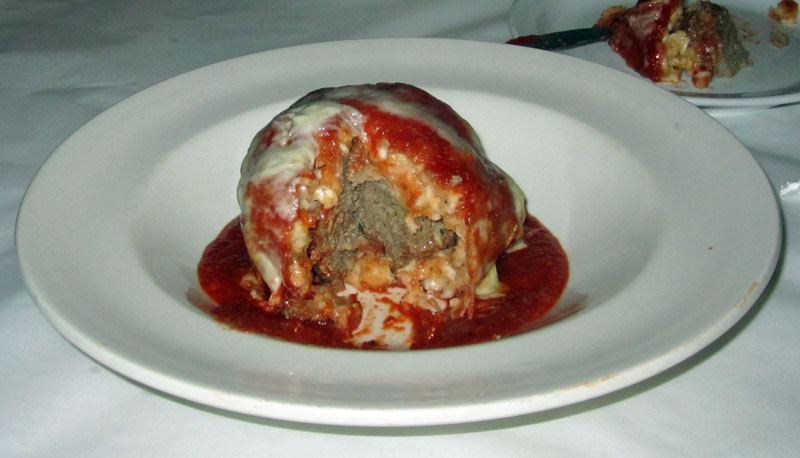 We decided to start with an appetizer, the Risotto Ball, a baked Italian meatball that was wrapped in risotto, and covered with some smoked mozarella. 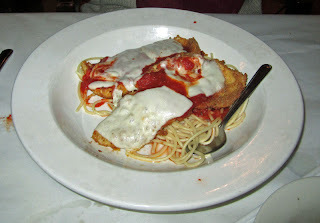 It was served on a bed or red sauce. The meatball itself was very tasty, moist and tender. I thought the rice just a bit too al dente for my taste, but very close to perfection. Overall, I'd give this a "thumbs up" from several aspects: originality, taste, and plating. I definitely would order it again. Our dinners came with a choice of soup or salad. For my dinner, I chose to have it with the Tomato Basil soup. Our server, Katie, did caution me that some diner's found it a bit too spicy. I'm glad she offered that caution, a wise move. It was indeed a bit on the spicy side, but I loved it! It had a nice amount of heat. I think that the heat did slightly overpower the basil--I could taste the basil, but it was quite subtle. However, overall loved this soup. The rich and deep tomato flavor was predominant and very fresh tasting. I'd order it again in a heartbeat! Tommy chose to have the salad with his dinner. Look who's eating healthy! The salad was topped with some carrots, a peperocini, and black olives. 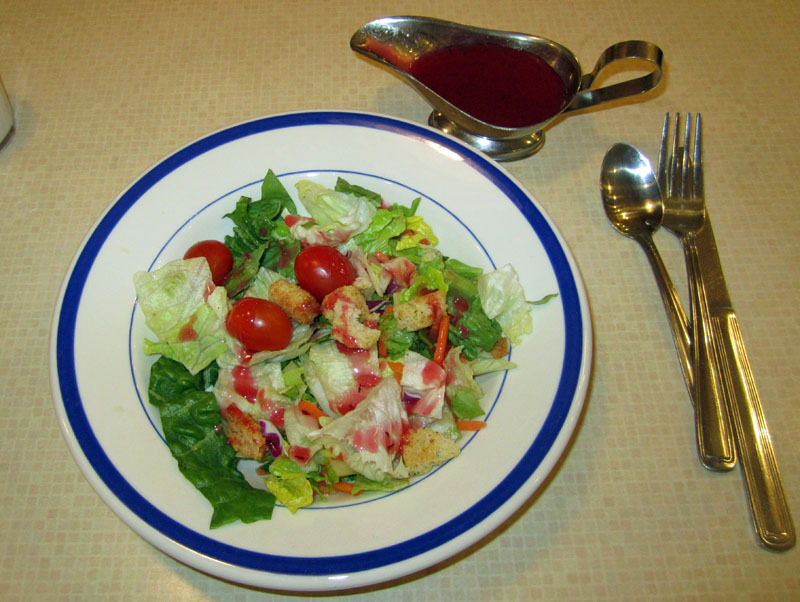 The dressing itself was very tasty and served on the side--I always appreciate that. The only real disappointment was that the lettuce was just plain old chopped iceberg. It seemed a bit out of place in the midst of a fancy setting and fine dinner. It was tasty enough, but just seemed a bit "low key" for the setting. But still, it was plenty tasty. 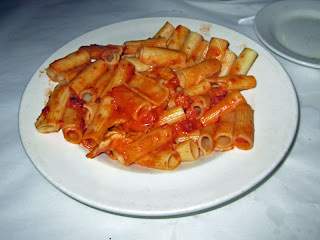 For my main course, I had the Rigatoni all Vodka, a pink cream sauce with pancetta and rigatoni. I added chicken to it, and there were some nice sized medallions of chicken that were very tender. The sauce itself was very good with a nice fresh flavor. There were a few bits of pancetta that seemed a bit tough or gristly, but overall it was just fine. I thought that maybe just a tad more sauce would have been in order. The nicely cooked, perfectly al dente pasta did tend to soak up the sauce--and that's a good thing. But it's also a minor point, since I thoroughly enjoyed this dish. And that's a good thing, too, as the portion was quite substantial and I have enough for a lunch at home later. 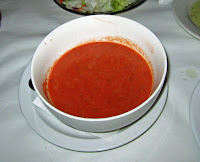 I also thought the dish seasoned perfectly, nice fresh tomato flavor, some oregano and basil, the cream--it was yummy! For his main course, Tommy had the Chicken Parmigiana, tender think scallopines of chicken were breaded and fried, topped with parmesan cheese and baked and served with a red sauce. All of this was served on a bed of spaghetti. 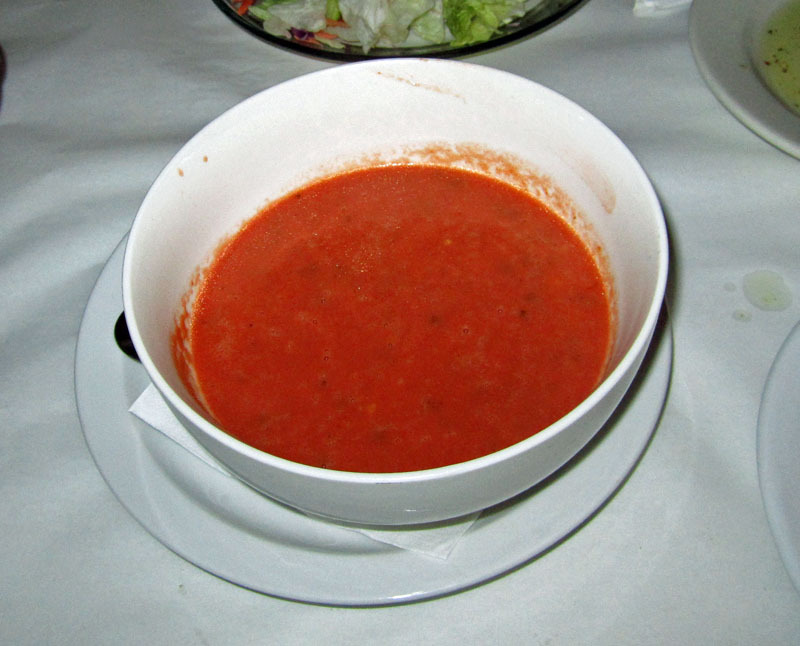 This seemed to me, as with my dish, a real Italian dish, hearty, showcasing the tomato flavor, and it was delicious. It's a good thing, too, as we also have leftovers of this, it was a very substantial serving. 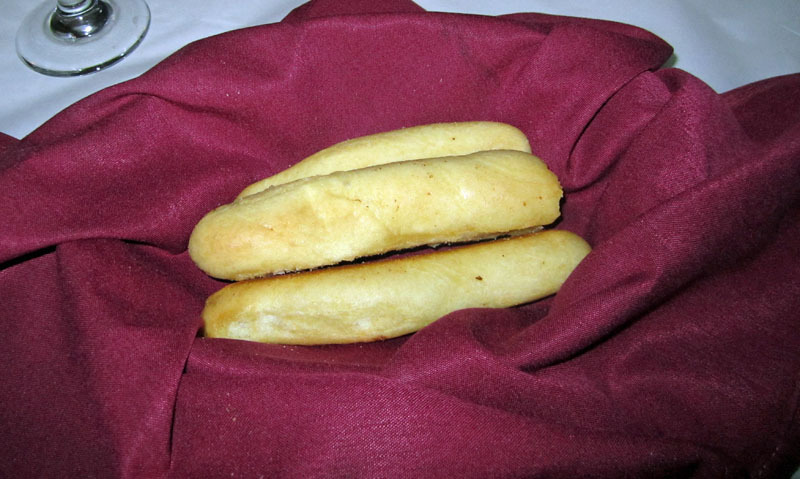 I cannot quit without mentioning the breadstick. They were very good. Tender, flavorful, a nice hint of garlic, and served warm. And there was a steady supply of them. They were great for sopping up the last of the soup and the last of the sauce on the plate, too. And were fine with just a bit of oil and pepper as well. Overall, I'd say Marco Dino's Ristoranti is off to a great start. We've heard from a few other friends who've eaten there and all agreed, it was very good. We were there on a Saturday night and I was surprise at how busy they were. It's a new endeavor for Rich and his crew, and if they keep up the good work, will be a success and a nice addition to the restaurant scene in downtown Sanford, one of my favorite places to hang out. 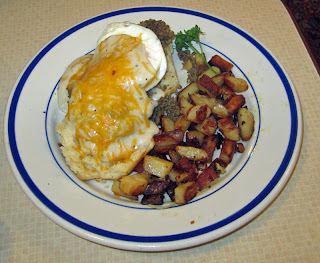 Comfort food is what I consider the main fare at Bob Evans, and a recent Sunday noonish time found at at our local Bob Evans. We did find our comfort food. My friend Tommy was in the mood for breakfast, so he ordered the Country Biscuit Breakfast, a split biscuit topped with crumbled sausage, a perfectly cooked medium-well egg, cheese and gravy. It also had home fries on the size. For Tommy, the breakfast was "just OK." The sausage was just crumbled sausage and the gravy was pretty plain, not sausage gravy. The potatoes were very good and he was impressed that they cooked the egg perfectly, just as he requested. I started off with a salad with raspberry viniagrette dressing. 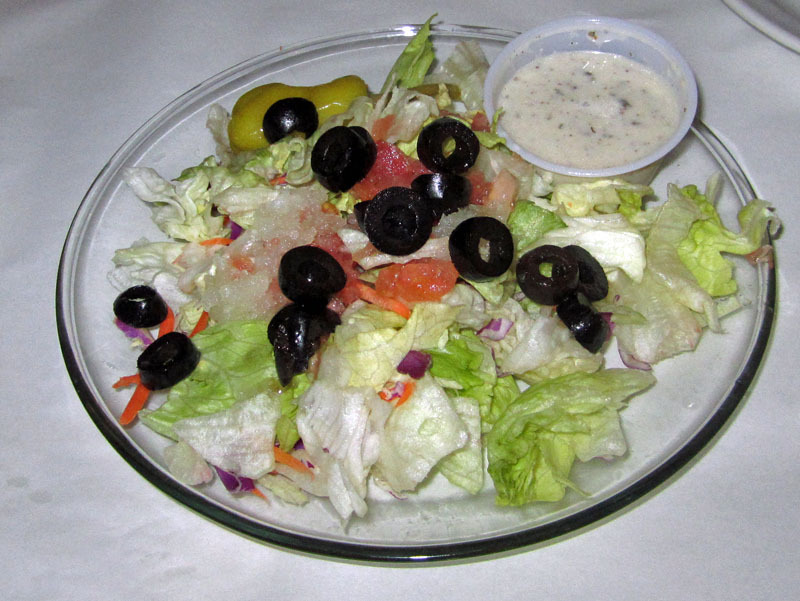 The salad itself was pretty ordinary, but fresh, a mix of iceberg and romaine lettuce, some julienne carrots and a few grape tomatoes. The raspberry vinagrette was decent and served on the side. It was all I'd expect of an average, ordinary salad. For my main dish, I had the Slow-Roasted Turkey Knife & Fork Sandwich. 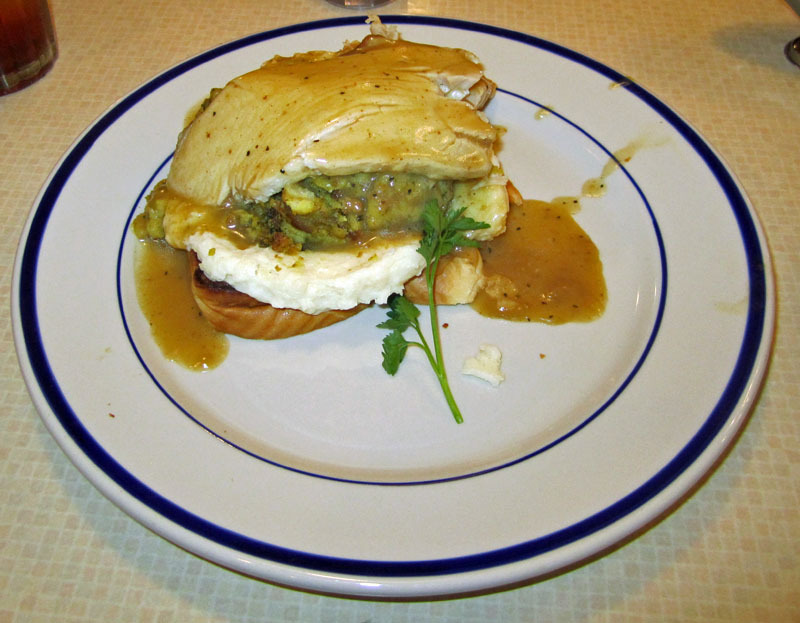 Bread was topped with celery-sage dressing, mashed potatoes, roast sliced turkey (not lunchmeat, but real turkey slices) and topped with gravy. It was all I expected it to be, very good comfort food. The dressing reminded me a bit in texture of Stove-Top stuffing, but that is good comfort food. 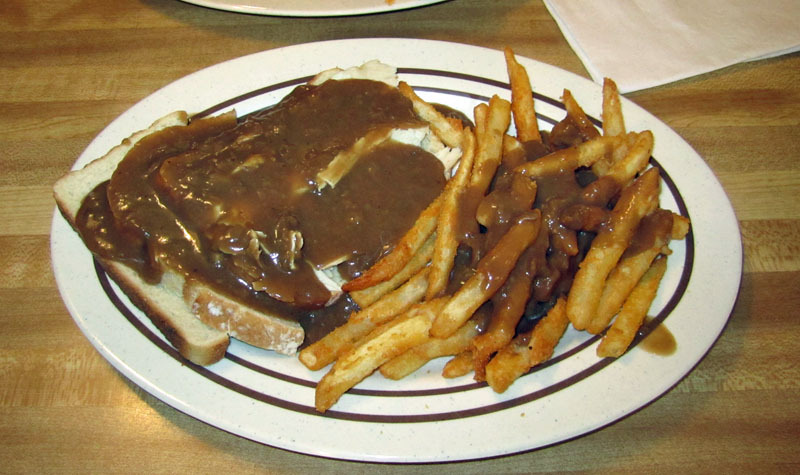 There was nothing about this "sandwich" that I did not like, except maybe it could have used a bit more gravy. The size was perfect for lunch, the flavor was good, savory, a bit of sweet, it tasted just like an open-face turkey sandwich should, and I left very satisfied. Our service was great and fast from start to finish, the place was bright and clean. I've eaten here before and will come back again. If I want simple comfort food at a resonable price, Bob Evans is one place that comes to my mind. Close, convenient, simple, decent food at a decent price. I was glad to get a chance to try the fare at Yum-Mì Sandwiches recently, and I was not disappointed. My friend Tommy and I were headed to an art show opening at The Center which is nearby, so we took the opportunity to try out Yum-Mì. We were both satisfied and enjoyed our meals. Yum-Mì is a fairly new establishment what is a very Asian area of Mills Street, just a bit west of downtown Orlando. It is very nicely decorated with a very modern feel. I cannot speak to the authenticity of the food. but I do know good food, so was excited to try some new things. You walk in and order at the counter, they give you a number, and then they bring your food out to you. It seems a decent system. We started with some yummìtizers (appetizers), some Spring Rolls, At the suggestion of the young man behind the counter, we ordered both the Shredded Chicken, and the Shrimp and Pork Spring Rolls. In due time they arrived. The Shredded Chicken were serverd with a peanut-based dipping sauce, a nice enhancement to the flavor of the spring roll. Both the spring rolls were fresh and tasty, filled with the protein but also with fresh veggies that included napa cabbage, carrots, and a host of other flavors. They were delicate but tasty. The Shrimp roll was accompanied by a thin, clear dipping sauce. I detected a bit or rice wine vinegar in it, but am not sure what else was there. It was very light in taste, a perfect compliment for the delicate shrimp in the roll. Yum-Mì's main fare is bánh mì, Vietnamese sandwiches. 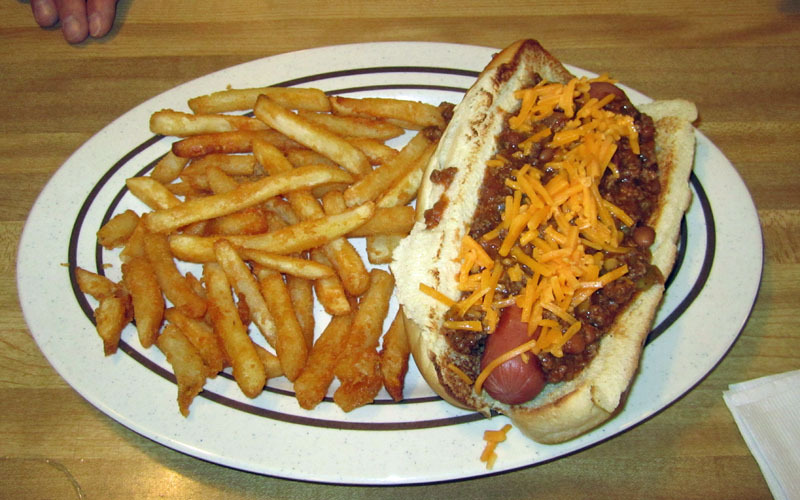 They are served on fresh baked rolls with a variety of meats and other filings. For his sandwich, Tommy ordered one of their specialty sandwiches, the Yin N Yang, containing five-spice bouron chicken, lettuce and tomatoes, in addition to some julienne carrot, cucumber, cilantro and perhaps a few other things. It was quite tasty, though did benefit a bit from some mayo. Still, it was a very tasty sandwich with a nice balance of meat and savory flavors along with the crunch and freshness of the vegetables. It was indeed "yummy!" I decided to try traditional, so ordered the Yum-Mi Traditional, called đặc biệt in Vietnamese. It, too, was very good, a nice balance of savory with the meats (admittedly quite finely sliced) and the crunch and freshness of the veggies: julienne carrots, cucumber, cilantro, and perhaps a few others I am not familiar with. It also had some sort of sauce, which added to the great taste. I liked this sandwich a lot, the balance of taste and texture on a fresh roll was excellent. I had only one complaint, and that was the stems of the cilantro. They were a bit tough and i had one or two that were exceptionally large. Less stem would have been desireable as it's kind of chewy and stong in flavor. But overall, I enjoyed my sandwich a lot. As a matter of fact, we enjoyed our whole meal, that the price is very reasonable. The sandwiches were well uner $5 each, and the appetizers were just something we wanted to try. We even took two spring rolls home, and, for a minute, debated on only eating half of our sandwiches. They were both quite filing. So we enjoyed our experience there, and I'd recommend that you give Yum-Mì a try as well. I think you'll be glad you did. It is indeed "Yum-Mi!" 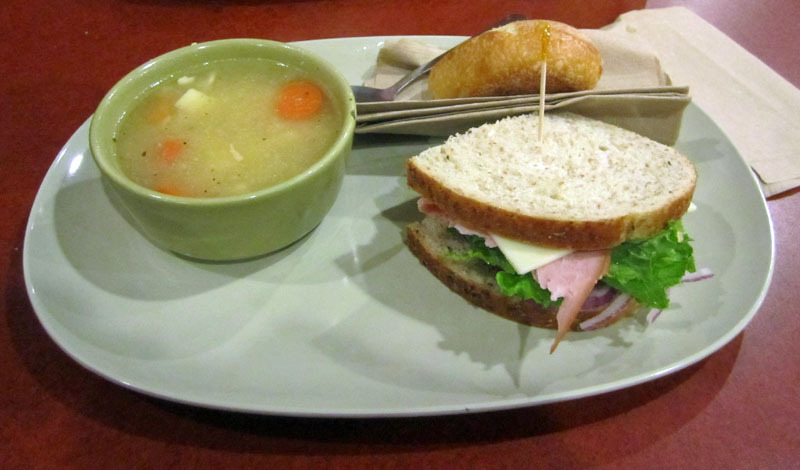 I'm asking myself, "Why don't we go to Panera Bread more often?" We wanted a quick and simple bite for dinner the other night and settled on Panera Bread. It was great from several aspects. I'm sure we'll be back. First, it was rather healthy. The menu is clearly posted and each item has the number of calories posted as well. That was extrememly helpful. It helped me choose the cup of Chicken Noodle Soup (80 calories for a cup) and the half sandwich Ham and Swiss (290 calories), some of the lowest calorie items for what I considered a dinner. The soup came with some warm bread which probably added a few calories, but it was very good bread and well worth it. Second, it was fast. We'd barely ordered when Our orders were ready. Now, granted, we were there past the normal dinner hour on a Friday and they were not packed, but they certainly had a steady flow of traffic. So from order time to pick up time was barely a minute, it seemed. Third, it was a pleasant and clean atmosphere. While we were there, they were busy keeping tables and area clean. There were a fair amount of people around, some camped out with laptops and wireless devices, enjoying the free WiFi, some just like us, in for a bit to eat. Fourth, it was reasonable! For the "Pick Two" with a cup of soup and a half sandwich, the damages were a mere $6.99. Unbelievable, and we left there quite full. And last, but certainly not least, the food was very good! The soup was delicious. The sandwich was great. The ingredients were fresh. And best of all, it was a rather healthy meal. What a win. I need to get out to Panera Bread more often. I think I will now! Alive after Five happens every month on the Second Thursday if tht month from 5-8 PM on First Street, downtown. January's them for a number of years has been aChili Cook-Off. I attended again this year and sampled 18 of the 34 different chili's there. After careful consideration, I am ready to declare my favorite. Admission to Alive after Five is only $7.00, and for that you get a wristband that allows you to taste food from the many merchants and vendors who set up shop on the street. And this happens every month, like clockwork, on the second Thursday of the month. It is, I'd say, the best street party in central Florida, with several blocks of First Street closed off and lined with vendors and merchants giving out food and beverage samples, $1 with wristband beer, and wristband holders get a ticket for food at an event sponsored location. It's always a great time, and this year's January event was no exception. Some of the chili served this year was really awesome. Some was just OK. And some did not really shine. The purpose of the event, though is to have fun. Some of the cooks are home cooks, and some are professional chefs. So, before I give you my results, I want you to keep that in mind. Everyone who participated put their heart and soul into this event which sponsored by and a fundraiser for the Historic Sanford Welcome Center. First, I must make mention of the Chile names, as two were really outstanding. 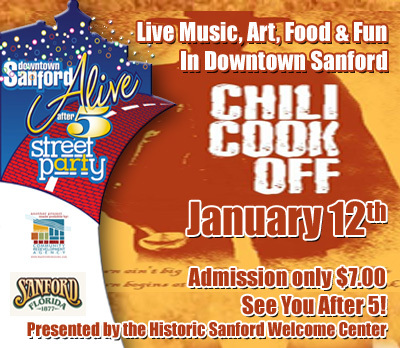 The first was the chili made by the Sanford Flower Shop: it was called Smokey's Florist Fire Chili. Get it? I love that name, and their chili was mighty fine too. The second was prepared by Magnolia Street Market and was called Praise the Lard and Pass the Beer Chili -- it was a beer chili made with pork belly, and also very good. Overall, the two above, along with the Red Solo Cup Chili made by World of Beer came in with a tie for second place, in my opinion. They were all very, very good. In my estimation, one other chili was in the same class but barely, just barely, edged out these there. So I declare all three of the above as in a tie for second place overall for the best chili I ate at the Chili Cook Off. My winner and championship chili for the contest, by a nose, was the Red Hot Mama's Chili from The Palette, a wine and light fare bar located inside Art Affair Gallery. First place, top notch chili. It was a true Texas-style chili, and Sherry, the chef and creator should know, she's from Texas. I asked her about it and she tells me they hand cut the chuck, roasted the peppers and skinned them, and made all ingredients fresh and from scratch. The care she took in this was evident, as it was for all the top level of chilis. Good job and congratulations to Sherri and The Palette, as well as all the top level chilis. Congratulations to all participants. It was a great and fun event! 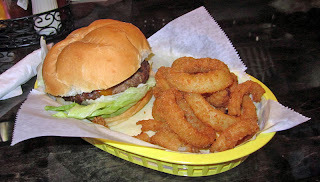 News Flash: Fat Rat's Lounge is now serving some good food as of late December 2011. Fat Rat's Lounge has been around for a while. It is an interesting places in that it is really three places, a bar, a middle pool table room, and a restaurant area, all connected. I'm not sure what it was like before, but recently a local favorite took over the restaurant area. Steve Richards (of Alive After Five Tail Gator fame) and Samantha did a nice job on our recent visit there. We'd been at The Palette earlier and have eaten there plenty of times, but wanted to try something new. Michael from The Palette suggested Fat Rat's and so we gave it a try. We're glad we did. We both decided to have the burger. There has not been a great burger around since Morgan's closed. I ordered mine medium rare and my friend Tommy ordered his medium. We had a nice chat with Steve and Samantha while we waited--they did not have any idea who I was. My burger was produced in good time and it was perfectly cooked to a medium rare. It was nice and juice and served on a delicious bun. The onion rings that accompanied it were pretty standard, but they were good, as were Tommy's fries. His buger, too, arrived just as ordered, it was exactly medium. Now, cannot say this was the best burger I've ever had, but it was darned good. There are two adjustments I'd have made on then. First, a bit of salt. Mine needed a bit of salt. Steve, I suggest you give them a light salt/pepper dusting when cooking, that would add a lot. The second was the placement on the sandwich. It was, top to bottom, top bun, cheese, burger, tomato, lettuce, mayo, bottom burger. But the burger was nice and juicy. I'd suggest putting the lettuce and tomato on top so the bun itself can soak up some of that good burger juice. Still, with a few tweaks, this would have been one of the best burgers I'd ever had. After we were done, I did introduce myself. I'm a big fan of downtown Sanford. This is a place I'd like to return to. They tell me they're planning on doing lunch too and expanding the menu. The told me of a few of their ideas and I think they're on the right path. And you know when someone like Steve really likes to cook when he does it for fun--by day he's an A/C contractor, this is his hobby, and probably his passion. Well, he does it well. I'd go back, for sure! Our waitress told us that the French Fries at Colonial Room were good and she was right. They were excellent. But that was about the high point of my recent meal there. I don't often get to Sanford in the middle of the day, and Colonial Room is open only for lunch and breakfast. So when we had the opportunity to try it recently, I jumped at the chance. We arrived in the early afternoon, around 1:30 on a Saturday. It was not very busy but was past the lunch hour. After a bit, we decided on our food. 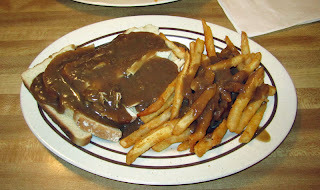 I had the open face turkey sandwich with French Fries and a side of coleslaw. The fries were indeed very good. And the turkey appeared to be real turkey, not just some sliced lunchmeat. It was pretty good. But the gravy seemed a big odd to me--I'd guess that it was canned gravy, it almost had a bit of a tinny taste and smell. It wasn't bad, but it was not really a turkey gravy. I'll bet that if I'd ordered the open face beef sandwich, I'd have gotten the same thing. And, there could have been just a bit more of it for the amount of bread. The coleslaw was OK, good even. Not great, but pretty standard. I guess it was the gravy that was the real turn off for me. I'm not sure that I'd go back. 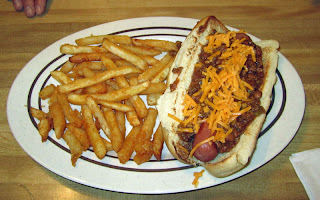 My friend Tommy had one of the specials, a loaded chili cheese dog with fries. It was a nice big hot dog. The chili was pretty standard, I'd guess out of a can. It was a decent hot dog for the price. And of course the fries were indeed very good. We had good service from Carol and the rest of the staff there. But overall I'd say it was just pretty run-of-the-mill, standard diner type of food, nothing too great. I probably would not go back, unless maybe to try their breakfast.